Bamboo is a tribe of flowering perennial evergreen plants. Bamboos are some of the fastest-growing plants in the world, due to a unique rhizome-dependent system. Bamboos are of notable economic and cultural significance in South Asia, Southeast Asia and East Asia, being used for building materials, as a food source, and as a versatile raw product. The word bamboo comes from the Kannada term bambu, which was introduced to English through Malay. For better or worse, zoos are how most people come to know big or exotic animals. Few will ever see wild penguins sledding downhill to see on their bellies, giant pandas holding bamboo lollipops in China or tree porcupines in the Canadian Rockies, balled up like giant pine cones. My instrument there is simply bamboo. The sound is straight from nature and it connects me to nature. Kinhyōshi yōrin (Yang Lin), hero of the Suikoden, holding a bamboo hat. From Utagawa Kuniyoshi's series of woodblock prints illustrating the 108 Suikoden - We explored the process of taking raw bamboo and turning it into a textile, but it requires the use of very strong solvents. - Josh Fairchilda. Bamboo has long been a subject dear to the heart of the Chinese painter. 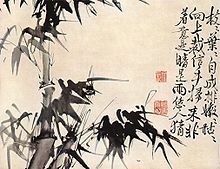 Bamboo painting has practically developed into a separate art in its own right, standing about midway between calligraphy and the painting of trees. After the corpse is almost completely burned [during cremation as per Hindu rites], the chief mourner performs the rite called kapälakriyä, the 'rite of the skull,' cracking the skull with a long bamboo stick, thus releasing the soul from entrapment in the body. I would like evolution to join the roster of other discredited religions, like the Cargo Cult of the South Pacific. Practitioners of Cargo Cult believed that manufactured products were created by ancestral spirits, and if they imitated what they had seen the white man do, they could cause airplanes to appear out of the sky, bringing valuable cargo like radios and Television|TVs. So they constructed “airport towers” out of bamboo and “headphones” out of coconuts and waited for the airplanes to come with the cargo. It may sound silly, but in defense of the Cargo Cult, they did not wait as long for evidence supporting their theory as the Darwinists have waited for evidence supporting theirs. My chief difficulty was in constructing the carbon filament, the incandescence of which is the source of the light...Every quarter of the globe was ransacked by my agents, and all sorts of the queerest materials used, until finally the shred of bamboo, now utilized by us, was settled upon. We explored the process of taking raw bamboo and turning it into a textile, but it requires the use of very strong solvents. Bamboo forest - Ordinarily, when he thought back upon those days, let alone upon his student years and the Bamboo Grove, it had always been as if he were gazing from a cool, dull room out into broad, brightly sunlit landscapes, into the irrevocable past, the paradise of memory. - Hermann Hesse. ...She arrives on the night of a full autumn moon, wearing a traveler's hat and grasping a branch of bamboo, a symbol of female frenzy. In an emotion-filled dance,...Sakamaki Kogyo. While cutting a way through the bamboos we suddenly stumbled upon a block of lava (andesite). I was delighted to see it, for I had not previously seen as much as a pebble since we left Laikipia. As I examined it, my interest was roused. Bamboo was one of the ‘four gentlemen’, its sturdy and straight qualities of painting representing the honest and upright official. The ability to quote lines of poetry relating to bamboo—and even more so to quote a poem on bamboo that quotes other poems on bamboo, and to explain the attendant allusions, is the province of a cultured man. Ordinarily, when he thought back upon those days, let alone upon his student years and the Bamboo Grove, it had always been as if he were gazing from a cool, dull room out into broad, brightly sunlit landscapes, into the irrevocable past, the paradise of memory. At my closed door autumn grasses grow. What could I do to ease a rustic heart? I planted bamboos, more than a hundred shoots. Round their railing I walk till night comes. Day by day a fresher air moves. To hear in their branches the sound of the autumn-wind. After dreaming of its famous bell, a grieving mother seeks her lost child at Mii Temple. She arrives on the night of a full autumn moon, wearing a traveler's hat and grasping a branch of bamboo, a symbol of female frenzy. In an emotion-filled dance, the woman begs the priests to let her ring the bell, which is represented on stage by a miniature construction. At its sound, the child recognizes his mother immediately. Bamboo is not a weed, it's a flowering plant, but these are weeds that grow wild to about twenty feet. They're not like bamboo which can make a forest and bloom once in a hundred years. Bamboo is a magnificent plant. Notice that the stiffest tree is most easily cracked, while the bamboo or willow survives by [[w:Bending|bending with the wind. Bamboo salt is a specially processed salt according to the traditional recipe using normal salt and bamboo...the bamboo salts are mainly ingested for health of the human body because bamboo-salts that are produced through the several processes give the decrease in toxicity and the conversion of acidity into strong alkalinity compared to sun-dried salts. The production process of bamboo-salts ordinarily is as follows: stamping inside bamboo hardens the sun-dried salt; it is baked at about 800 degrees centigrade for 8-10 hours in a kiln, resulting in a lump of salt through bamboo’s resin soaking into sun-dried salt; the hump is powdered; repeatedly stamped inside bamboo and baked, especially at about 1000 to 1500 degrees centigrade of higher temperature lastly. An Indian hurled a bamboo spear into the captain's face, but the latter immediately killed him with his lance, which he left in the Indian's body. ...that is, the women and children must never know that they are really bamboo flutes, or hollow logs, or bits of elliptic wood whirled on strings. It was a nice little joint with bamboo furniture and Mexican gimcracks. One little lamp burned. It was all right. And the rain hammering like that on the window made it good to be in there. ...before the sun has become completely hidden — it is now fleeing amid the tall bamboo trees like an animal pursued by shadows — I shall succeed in reducing this grove of trees to a catalogue. To be sure god exists in all things. God can be realized through all paths. All religions are true. The important thing is to reach the roof. You can reach it by stone stairs or by wooden stairs or by bamboo steps or by a rope. You can also climb up by a bamboo pole. The bamboo in its simplicity expresses its usefulness. Man should do the same. ...It’s like in old Japanese paintings – if you were to paint a bamboo forest, you should be able to find its essence with only three strokes. 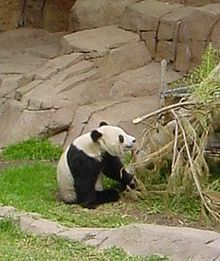 While the polar bear is mostly carnivorous and the giant panda feeds almost entirely on bamboo, the remaining six species are omnivorous, with largely varied diets including both plants and animals. The body of bamboo in repose should resemble a jade dragon; the form of a bamboo with a dancing appearance should be golden phoenix turning its body. - Zhang Tuigong. With bamboo poles we prodded the snake at the head and tail, standing by with the nooses, ready to slip them on when he stirred sufficiently. Before he realized what was happening, we had the head-noose over him. The Empress Dowager, who had been painting a design of bamboos on silk when the warrior was announced, dismissed him with contunely. 'Your tail,' she said elliptically, 'is becoming too heavy to wag. A gentleman's got a walking stick. You'd better never bother with me ol' bam-boo. But you'd better never bother with me ol' bam-boo. Who's there that you don't reach out? You became the the platform to carry him to heaven. Bamboo is a Chinese symbol for longevity because of its durability, strength, flexibility and resilience. It survives in the harshest conditions, and seems to endure through all the brutalities mother nature can dish out - still standing tall, and staying green year-round. 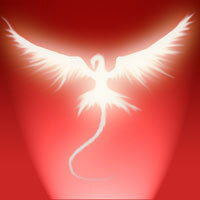 Its flexibility and adaptability are a lesson to us all that the secret of a long happy life is to go with the flow. Feng Shui practitioners recommend putting bamboo plants in the front of your home to assure long life for all those who dwell there. The first thing I do when I’m creating, either for stage or for cinema, is to find the idiograph of the story. Which is; the one, simple expression that can tell everything. And at the same time be recognizable for the audience. It’s like in old Japanese paintings – if you were to paint a bamboo forest, you should be able to find its essence with only three strokes. The first thing that I remember that made me realize we're in trouble, in the distance I saw something way up in the air and I couldn't figure out what it was but as he came closer on the horse I realized what it was. It was a head. He had it on a bamboo pole. A head on a bamboo pole. When I saw that, you know, I figured we were in big trouble. A gentlemen is comparable to bamboo because of their similar virtues. What people may describe and paint are only the form, the color and the type of bamboo; what neither description nor painting can encompass are the virtues for which bamboo stands. Bamboo stems are hollow, empty hearted, standing for the virtue of humbleness... Bamboo's joints (jie), which are evenly spaced, and hence represent the mean, are clear-cut (zhen) like the virtue of chastity. The body of bamboo in repose should resemble a jade dragon; the form of a bamboo with a dancing appearance should be golden phoenix turning its body. In former times, in Japan, very simple things make men happy. Moon right on fish pond at certain moment. Cricket singing in bamboo grove. Very small things bring very great feeling. Japan a little island country, must make do with very near nothing. Not like endless China, not like U.S.
Larry Abraham has traveled throughout the world (including low-profile trips behind the Iron and Bamboo Curtains). He has lectured extensively, and he has written scores of articles and another book, Call It Conspiracy, exposing the power, the ploys, and the grand design of the real rulers of the Establishment...in both the East and the West. If you ask, Grandmother, what did you say? she will look up absentmindedly and, after a while, say, Oh, you're back from school? Are you hungry? There are sweet potatoes in the bamboo steamer. When she chatters it's best not to interrupt. Painters of today start joint after joint and pile up leaf on leaf. How can that be a bamboo. When you are going to paint bamboo, you must first realize the thing completely in your mind. Then grasp the brush, fix your attention so that you see clearly what you wish to paint; start quickly, move the brush, and follow straight what you see before you, as the buzzard sweeps when the hare jumps out. If you hesitate one moment, it is gone. The forests that surround the village there in Nara, Japan are filled with beautiful bamboo trees. In Japan, the symbolism of the bamboo plant runs deep and wide and offers practical w:Lessonslessons for life and for work. The bamboo sway with even the slightest breeze. This gentle swaying movement with the wind is a symbol of humility. Their bodies are hard and firm and yet sway gently in the breeze while their trunks stay rooted firmly in the ground below. Their foundation is solid even though they move and sway harmoniously with the wind, never fighting against it. In time, even the strongest wind tires itself out, but the bamboo remains standing tall and still. A bend-but-don't-break or go-with-the-natural-flow attitude is one of the secrets for success whether we're talking about bamboo trees, answering tough questions in a Q&A session, or just dealing with the everyday vagaries of life. The body of a single bamboo tree is not large by any means, but the plants endure cold winters and extremely hot summers and are sometimes the only trees left standing in the aftermath of a typhoon. They may not reach the heights of the other trees, but they are strong and stand tall in extreme weather. Bamboo is not as fragile as it may appear, not by a long shot. Remember that we must be careful not to underestimate others or ourselves based only on old notions of what is weak and what is strong. You may not be from the biggest company or the product of the most famous school, but like the bamboo, stand tall, believe in your own strengths, and know that you are as strong as you need to be. Be always ready. Unlike other types of wood which take a good deal of processing and finishing, bamboo needs little of that. As the great Aikido master KenshoFuruya says in Kodo: Ancient Ways, "The warrior, like bamboo, is ever ready for action." In presentation or other professional activities too, through training and practice, we can develop in our own way a state of being ever ready. Bamboo is a symbol of good luck and one of the symbols of the New Year celebrations in Japan. The important image of snow-covered bamboo represents the ability to spring back after experiencing adversity. The bamboo endured the heavy burden of the snow, but in the end it had to power to spring back as if to say "I will not be defeated." This page was last edited on 18 December 2017, at 14:44.